Finding innovative and useful Apple iPhone accessories gives us a buzz, and finding out that the iANGLE 2-in-1 iPhone and iPod touch accessory has had a redesign is very pleasing indeed. 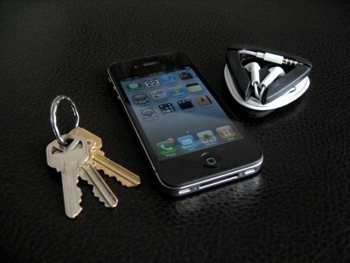 The iANGLE accessory was first released for the iPhone 3G and 3GS, we will give you a few details on where you can buy the iANGLE for the iPHone 3G, 3GS and the iPhone 4 via the official website and another online store. We had an email today saying “Dear Mark I’m writing to announce the redesigned iANGLE, a 2 in 1 iPhone and iPod touch accessory. 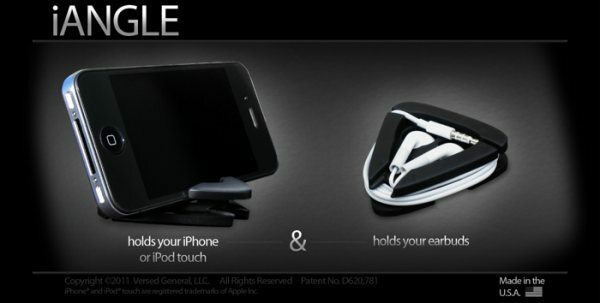 On one side the iANGLE is an earbud cord wrap and on the other side a viewing stand. The new iANGLE is now available at www.iangle.net. 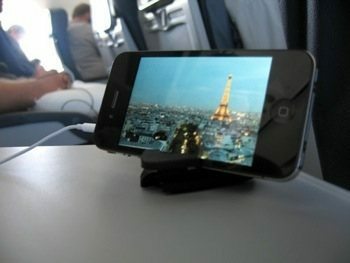 We at Versed General would greatly appreciate having the redesigned iANGLE featured on phonesreview.co.uk. We really love this product and cannot believe we have not come across it before, it is simple but very useful indeed. It is a product that can easily fit into your pocket, handbag etc that allows users to house their earphones as well as becoming an stand for your iPhone. By wrapping up your earbuds stops the cord getting all in a tangle, the new iANGLE accessory comes in many colours including black, white, blue, green and pink. If you visit Amazon you can see that they have the iANGLE on sale for the iPhone 3 & 3GS for only $12.99, they also sell the iPhone 4 version here for $15, which is the same price as the official iANGLE website. The iANGLE is a simple design but very clever that it has kept the size down to a minimum, it has been designed with rubber making it nice to touch but yet still highly durable. Having a product that houses your earbuds and that also reverses as a stand in brilliant, the holes are designed for Apple earbuds to fit perfectly. Below is a video of the product, which we recommend you watching. Now we do not have any iANGLES in our hands so we cannot give a full hands-on review, but they are self-explanitory really.